A while ago, I had been looking for books about Norse Mythology. 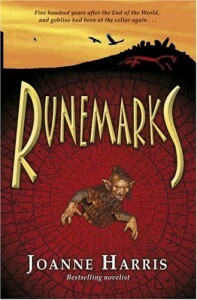 Of course, I found a lot of non-fiction books that I will give a try soon, but I also found ‘Runemarks’. The summary sounded very interesting to me, in fact it was the only fictional Norse Mythology book that actually interested me so much that I was willing to buy it. Beware, this review might have some minor spoilers, so if you want to read the book, beware. The first thing I noticed, was that there were maps in the front of the book, and a list of all the (important) characters that you were going to meet in this story. I really liked that, especially since every Norse God (Aesir and Vanir) seemed to hate/dislike Loki. The Characters – There were enough non-God characters of course, an entire village full of them. But I didn’t like any of them, except for Maddy, mainly because everyone in the village hated Maddy for having a runemark on her hand. Maddy was a bit strange, which I liked, and she had a friend called One-Eye who taught her almost everything she knew. There are the goblins (one of which was called Sugar-and-Sack) and their captain. From the first moment they mentioned things about their captain, I was certain it was Loki. And then there were some other characters, like Hel (the mistress of the underworld, who I liked just as much as I liked Skadi and Loki), Jormungandr (the world serpent, whose name I have been writing wrong all along), The Nameless, and the Devotees of the Order in World’s End (who really creeped me out). The Gods – The Gods were awesome, though we didn’t meet the Aesir (Thor, Frigg, Sif, Tyr and Balder) until somewhere near the end of the book. I really liked reading about the Vanir; Skadi (who at some points was actually WORSE than Loki, wow), Bragi, Idun, Freyja, Frey, Heimdall and Njörd. Of course there were Odin and Loki as well, and I just really enjoyed seeing them all interact with each other. But I just don’t like Loki at all. Though in this book he is quite ‘normal’, I had the feeling he was going to trick everyone and betray them. Half of my notes on this book are stuff like ‘No Loki’, ‘Don’t you dare Loki’, and ‘Loki you idiot’. In the end, I can say he surprised me. The Mythology – Of course it might be a bit handy if you know something about Norse Mythology when you start reading this book, because even though you will learn a lot about it when reading the book, you might get confused as well. I personally liked learning all these things, and I just really wished there was a(n online) course I could do about Norse Mythology in my country. The Plot – It was both predictable and very unpredictable. Some smaller things I figured out (like Lucky/the Captain being Loki, the Whisperer not just being the Whisperer, Thor being Maddy’s dad), but the majority of the book I just found myself going ‘wait what? !’ out loud a couple of times. The one thing that I didn’t like, was that the POV’s changed throughout the story. I would have been happy with just reading it from Maddy’s POV, and hearing what happened during the other POV’s from someone else (Odin or Loki or something like that). Honestly, it did make the story a lot more interesting, but at some points I just got annoyed/confused by the changing POV’s right in the middle of a chapter. During the end of the book, everything started to happen all at once, and I actually got a bit confused at some points. I reread certain parts and understood it a bit better, but still I didn’t fully understand everything that happened, until it was over. Oh well.. The Writing – I loved the way the story was written, and it made me want to read more of Joanne Harris’ books. I am certainly going to read Runelight, the second book of this series (and the last, I believe, meh). There was one other tiny thing that I didn’t really like, and that was the fact that the chapter numbers started over again with every ‘book’. There were nine ‘books’ in total, and every time, the chapters started at ’1′ again, and that is just a tiny pet peeve of mine. But in the end, I loved this book to bits, and I actually went reading up until at least 3am last night, because I just wanted to know what happened in the end. If you want to read a nice fictional book about Norse Mythology, I certainly recommend Runemarks to you!